This quote is so profound and so true that I could stop right here and you’d have plenty to think about. 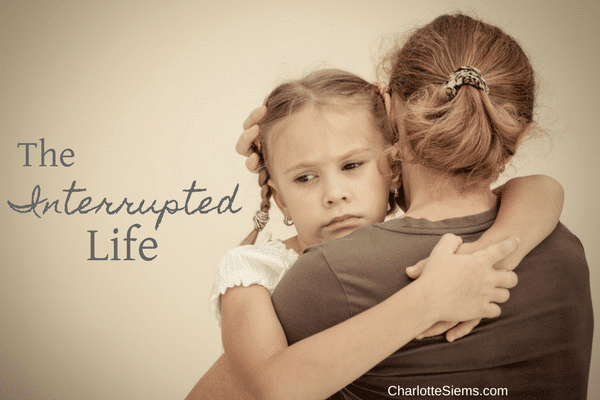 To be honest, there was a time when I thought despairingly that someday I was going to write a book titled The Interrupted Life. Speaking of interruptions, we actually have a household rule that you can’t talk to Mom while she’s in the bathroom (unless, of course, someone is bleeding profusely, which is usually not the case—rather, it is normally an argument such as, “Mom! Emily says my last name isn’t Siems!”). Now that I’ve got a few years on me and most of my chicks have flown from the nest, I have a different perspective. All of those interruptions are life. The baby who “interrupted” my sleep by waking several times at night to nurse. The toddler who sleepily shuffled down the hall to “interrupt” my sacrificially early devotional time. The six-year-old who “interrupted” my writing time to ask if I liked her gift (a box containing 44 cents, mostly pennies). The husband who “interrupted” my evening with musings on his day when I really wanted to read. Each of these interruptions magically become precious memories when circumstances change. The babies and toddlers grew up and now live in dorms and other houses. The six-year-old turned eighteen overnight (or so it seemed). The husband could be taken in an instant, as we’ve seen with family and friends in tragic situations. The point is not to live in morbid anticipation of tragedy, but to appreciate and have a realistic view of what life is right now. Not next week or ten years from now. It helps to remember that every once in a while. We have a choice about how we will think and respond when interruptions come. And come they will. I know it doesn’t feel like it right now, but some of those things that are driving you crazy or are pushing you into self-pity are the very things that will become precious memories that you will long to relive. What I wouldn’t give to have some little boys and girls back home for a day, for me to read them a story and wash their feet and rock them to sleep. I thought it would never end. We seemed to have an endless supply of boys for so many years….and now they’re all grown. Remember that your children will be adults most of their lives. So don’t wish away the moments and don’t think that real life starts when the toddler is potty-trained or the kids are in school. Whatever is sent your way, day by day, is precisely your real life. Gosh, I love this! I shared your quote from C.S. Lewis on my FB page! This post was so needed right now as I’m in the throws of interruptions and sometimes feel like I hear the word Mommy 100 times a day!! Thank you for bringing it into perspective.